Ever juggled what to cook on a hectic day? For myself, I’ll turn to make a pasta dish. 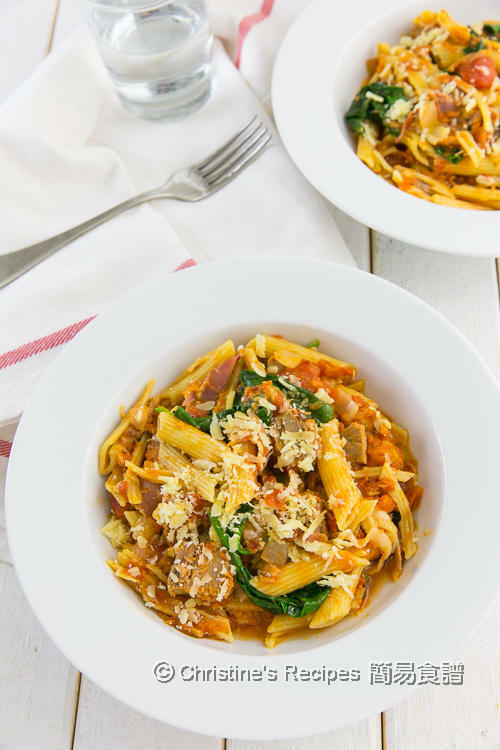 This tuna pasta dish will only take 20 to 25 minutes. Although I was planning a quick meal, I still wanted to impress my family with a tasty tomato sauce, that’s incorporated some semi sun-dried tomatoes. For convenience, canned tuna was used. 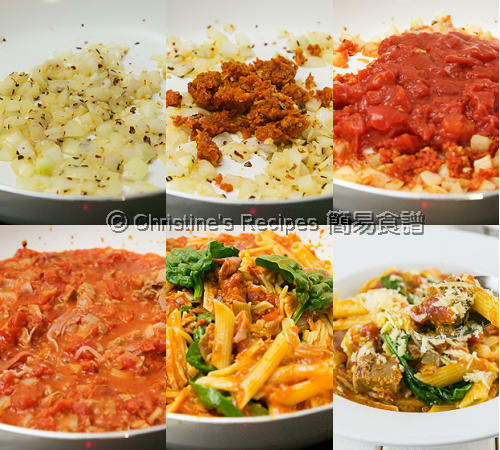 What I like using canned tuna, it’s inexpensive and packed with protein, going so well with the tomato sauce. Top left: Prosciutto. Top right: Semi sun-dried tomatoes. Bottom right: canned tuna. 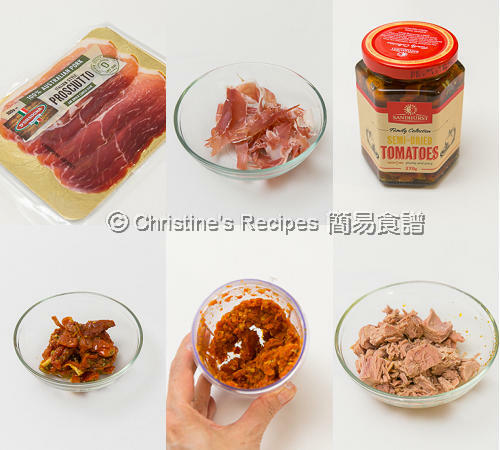 Use an electric food processor to blend the semi sun-dried tomatoes into a paste. Set aside. Prepare the tomato sauce. Heat oil in a fry pan to sauté onion over medium high heat. Add garlic and red pepper flakes. Cook until aromatic. Stir in the sun-dried tomato paste. If you feel it’s dry, add some more oil to adjust. Pour in the diced tomatoes with juice. Add Prosciutto and tuna. In the meantime, following the package instructions, cook the pasta in salted boiling water, but 2 minutes less, as it’ll continue to cook in the sauce. Drain out the pasta and save 1 cup of the pasta water to adjust the consistency of the tomato sauce if needed. Add the pasta into the sauce. Season with salt and pepper. Stir in baby spinach and Parmesan. Serve immediately. The semi sun-dried tomatoes taste sweet and enrich the tomato sauce, available at supermarkets. Bacon can be used instead of Prosciutto. If using bacon, sauté and render its fat before adding the onion. 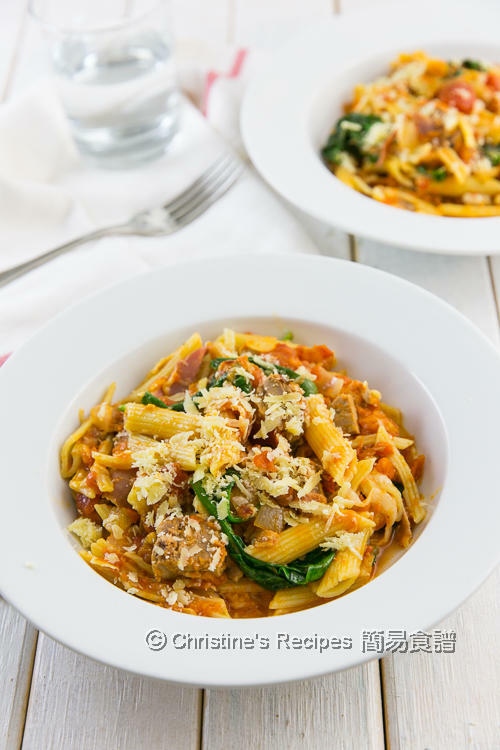 Lucky me having almost everything for this delicious pasta dish..can't wait to give it a try! Thanks for sharing, Christine.